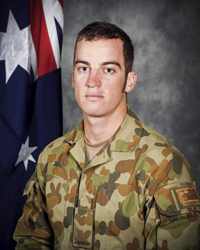 It is with deep regret the Australian Defence Force confirms that Private Matthew Lambert was killed in action during operations in Afghanistan on 22 August 2011. Private Lambert was a member of the Mentoring Task Force - Three and was from the 2nd Battalion, Royal Australian Regiment (2RAR) based in Townsville, North Queensland. Private Lambert is survived by his spouse, parents and family. Private Lambert was born in Kogarah, NSW in 1985. He joined the Army from southern Queensland enlisting in the 9th Battalion, Royal Queensland Regiment in August 2005, transferring to the Australian Regular Army in February 2007 and posted to 2RAR in Townsville. Private Lambert is described as a well respected soldier who excelled in any task he was assigned, and was looking forward to serving his country in Afghanistan. Australian Active Service Medal with clasp International Coalition Against Terrorism, Afghanistan Campaign Medal, Australian Service Medal with clasp Timor - Leste, Australian Defence Medal and the Timor � Leste Solidarity Medal. OPERATION ASTUTE (East Timor) - June 2009 � November 2009. OPERATION SLIPPER (Afghanistan) � June 2011 � August 2011.